Running a not-for-profit business has a unique set of challenges. Marketing to nonprofits can be even more difficult. We are proud to have the experience to understand those challenges and are asked to create marketing materials for some amazing nonprofit organizations. We were thrilled to have the opportunity to create this beautiful postcard series for Mayer Hoffman McCann P.C. (MHM). MHM supports many nonprofit companies with professional services such as accounting and tax advisory and specialized continuing professional education. 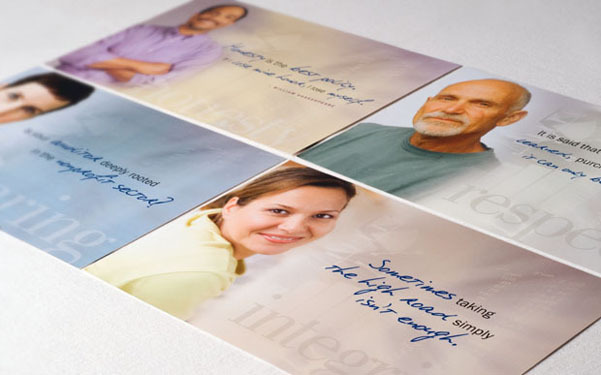 The postcard series focused on four guiding principles: integrity, honesty, caring and responsibility. The postcards were mailed to current and potential clients to illustrate that MHM understood their unique business challenges and was there to help these organizations to do what they do best: fulfill their missions.